Conventional Flue for using with a proper chimneyThe Gazco Logic HE Winchester is a stunning glass fronted gas fire providing your home with a sleek yet cosy feel. 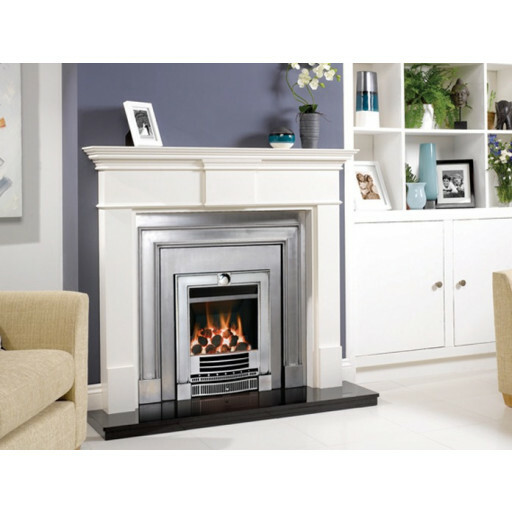 The high efficiency gas fire provides a maximum of 89 percent efficiency & 4.5kW of heat. For balance flue fires in residences without chimneys, the efficiency can be 86 percent, with the fire producing a heat output of 3.4kW. The Gazco Logic HE is made to fit perfectly into any standard fireplace opening of 16 by 22 inches.When you purchase the Gazco Logic HE, you can customise your new fire by choosing between either classic coals or tiny white pebble in addition to ability to choose the colour of the trim with black, chrome and brass colour options available. This flexibility allows you the ability to pick the trim colour that compliments the existing decor of your home.The Gazco Logic HE is manual controlled as standard, but customers can also choose to between both remote and side control options at an additional cost.You can rest assured that when you purchase this fantastic fire you are buying an appliance of outstanding quality and reliability, with the British manufacturer providing additional peace of mind with a fantastic 5 year warranty.